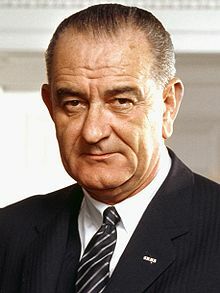 Lyndon B. Johnson was the 36th president of the United States and was married to First Lady, Lady Bird Johnson. Many of Lady Bird's interviews are collected at the LBJ Presidential Library at the University of Texas. In one interview she talks about her daughter's "eye problem" and how an optometrist who prescribed a program of eye exercises (vision therapy) cured her and allowed her to function to the limits of her intellectual abilities. M: Travail. Was it Janet Travail, or something like that. J: Janet Travail directed her, I think, as I recall, to a doctor, and his name I will too remember in a few minutes, because he has remained our lifelong friend. [He] figured out what it was, gave her a series of eye exercises that changed her whole life and personality, because she became an achiever up to her mental capacity, her very remarkable mental capacity, whereas before, because of this eye problem, she had just kind of been stunted, and frustrated, and angry. It changed her personality, her rate of performance; it was a wonderful blessing. M: Was it eye exercises only that changed it? M: Well, it's a good one. J: --in our life it was an important one." Here is a link to what seems to be a piece written by President Johnson's daughter, Luci, on her treatment by Dr. Kraskin and how it impacted her life: http://visiontherapyofvermont.com/2011/02/. The interview above and Luci's comments at the previous link resonate with what so many patients with developmental vision problems and eye coordination problems (as well as their families) experience every day. Vision therapy's positive impact on the patient also has not changed since Lady Bird's time. The sad thing is that the run around that some patients receive before they find the right doctor and the right treatment is the same today as it was in the 1960's when Lady Bird and her daughter experienced the frustration of a treatable condition that the "best doctors" could not figure out. To learn more about vision therapy visit www.visiontherapy.ca and to learn about children's vision development visit www.kidsvision.ca. 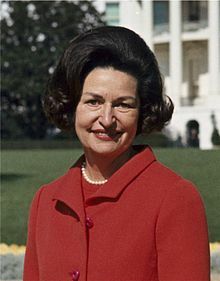 The photographs in this post come from Wikipedia and are Lady Bird Johnson and President Lyndon B. Johnson.